It’s not often you can point to a decade-long sporting ban and say that it’s a weak outcome. But it’s time rugby league finally told John Hopoate he no longer has a place in the game. Ever again. Simply put, a ten-year ban is far too soft a sentence for this serial thug. The 44-year-old’s latest offence, which occurred in July, was striking an opponent in a Manly A-Grade match and threatening other opposition players. But since he failed to report the alleged taunt during or even after the match – saying, “I was too angry to say it because all I wanted to do was slap the guy who was being a smart arse” – the panel gave his claims short shrift and banned Hopoate for ten years. Except it was actually five years, with the next five ‘suspended’, meaning his involvement in the game after that initial period would be considered on a case-by-case basis. Now, while there is no room in the game for racist behaviour, the panel’s response to them would indicate there is no real evidence to support Hoppa’s claims that the alleged incident occurred. 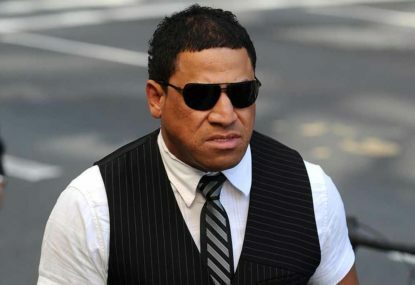 But there is ample evidence to suggest there is no longer any room in the game for John Hopoate. 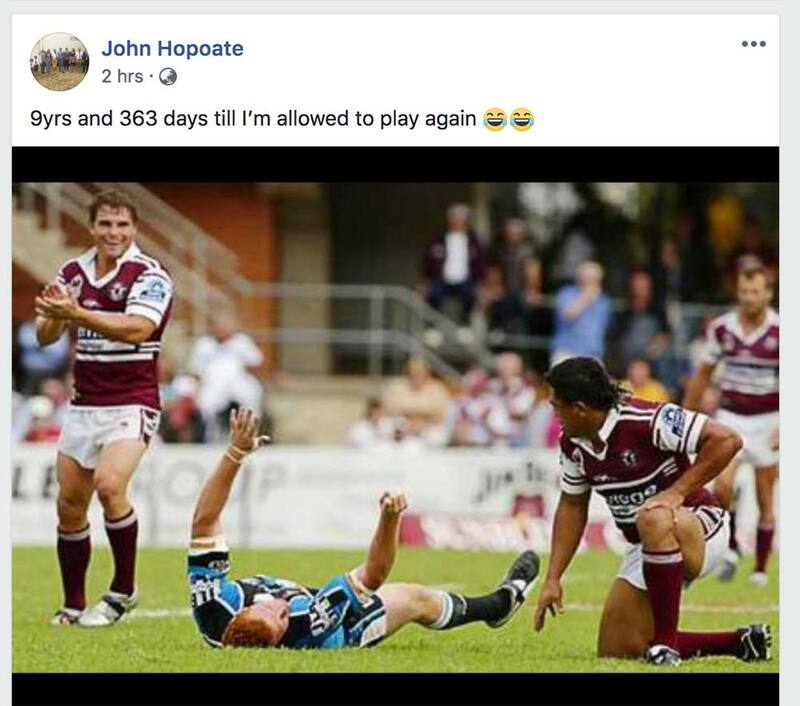 Hoppa has a rugby league wrap sheet that dates back decades and, as a result, he holds the shameful record of most time spent suspended from the game – a whopping 45 weeks! In fact, with Luke O’Donnell and Craig Smith’s 32 weeks the equal-next closest, Hoppa is an outlier in the vein of Don Bradman, the likes of which we will (hopefully) never see again. Yet it’s easy to forget how disgracefully he acted to have been ruled out for almost an entire calendar year over the course of his career. The first and most obvious incident that springs to mind was his ‘interfering’ with opposition players in 2001… by jabbing his finger into their anuses. It was such a bizzarre thing to do that the word ‘Hopoate’ now appears in Urban Dictionary, and the incident even rated a mention in a Hollywood comedy starring Matthew Broderick, Alec Baldwin and Toni Collette. But could you imagine how that would go over in today’s world? A few weeks ago, there was talk of Andrew Gaff being charged with assault for punching Andrew Brayshaw on an AFL field. In the light of the #MeToo movement, what would people think of Hoppa’s actions today? Yet he did his 12-week stint on the sidelines and was welcomed back into the game. Hopoate’s (reported) response, according to the Sydney Morning Herald at the time? Cool, so you were just screaming homophobic abuse and threats at random people? That’s heaps better. He copped nine weeks for that one and it was broadly speculated it would be the end of his career. But no, he was back again for season 2005, and he kicked the year off by abusing a ballboy in Round 1 (in a truly stunning turn of events, it was swiftly proven that the ballboy was completely in the right). The very next week came the final nail. In a game against Cronulla, Hoppa leapt into the air, leading with his left elbow, to collect 19-year-old Keith Galloway in the head – a shot which left the young Shark unconscious, bleeding from the ear and in need of stitches. But his sporting career did not come to an end. Hoppa took up boxing and – surprise, surprise – he was really good at punching people. So much so that he rose through the ranks to be named Australian heavyweight boxing champion in 2008, defeating Bob Mirovic. And that’s worth highlighting – this bloke isn’t some mug chucking his hands around like most people who get in a scrap. He’s now a trained professional with a national heavyweight belt. So when he says, “I threatened to bash him and I’d do it again”, it’s to be taken a tad more seriously. And it’s not even the only time he’s said it in the last 12 months! Now, admittedly he said the line about Blair with a bit of a laugh, but the suggestion Hoppa was “joking” – as TVNZ put it – doesn’t hold water. Because he always bloody says it, and not just on the footy field. Or when, in 2011, he was convicted and fined after pleading guilty to assault occasioning actual bodily harm over an incident that occurred in Kings Cross the previous year. Yeah, he hasn’t just bashed or threaten people on a footy field. You laugh John, but 13 years after that disgraceful hit on a teenager, you were back playing footy again. It’s time to take that option away. John Hopoate has made it abundantly clear over almost 20 years that he does not learn from his mistakes, and he’s proved himself a threat to the health and safety of other players on a footy field. Throw in the man’s repeated run-ins with the law – I didn’t get time to go into all of his legal troubles, having been before a judge again only last year – and you can understand why the NRL were willing to take Manly to court over allowing Hopoate to coach their SG Ball team in 2016. A five-year ban doesn’t begin to cut it. Nor does ten. John Hopoate should be banned from rugby league for life.